Perennial power Flintridge Prep and fast rising Pioneer top the initial girls and boys San Gabriel Valley Division III Rankings. This new ranking system adjusts school enrollment according to demographic factors (explained here), and divides the 78 schools of the SGV into three divisions. You’ll see that several of the teams below didn’t enjoy a great deal of “success” in 2018, due to unadjusted enrollment divisions and league assignments. These rankings evaluate teams in true, “apples to apples” fashion. 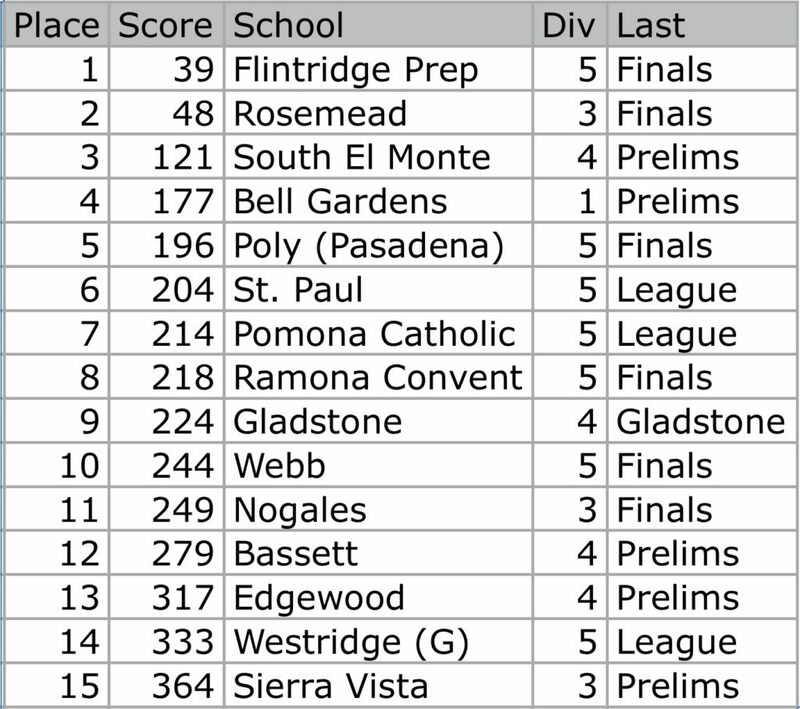 These specific rankings are based on a merge of the top 15 teams in the division, using each team’s last race up through CIF finals. For teams that did not advance to prelims, times were adjusted to the equivalent at the Riverside XC course. The goal is to try to determine what would happen if these had met up in their final race. South El Monte (CIF Div. 4) – fourth in the Mission Valley League, the Eagles were the SGV’s 20th best team at CIF Prelims while just missing a spot in the Div 4 Finals. Bell Gardens (CIF Div. 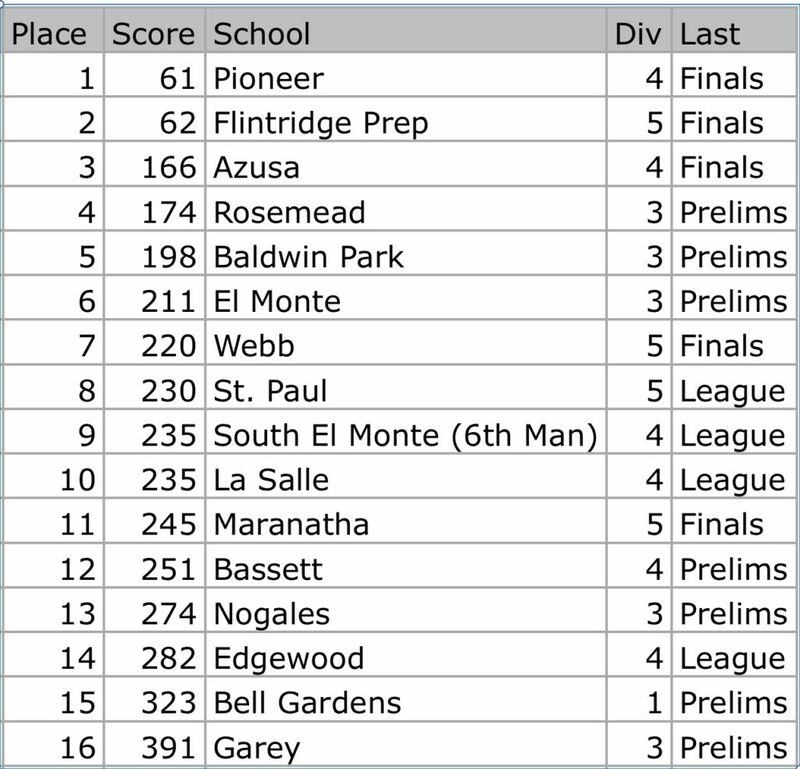 1) – were second in the Almont League Finals, and ranked 24th among SGV teams at CIF Prelims. St. Paul (CIF Div. 4) – stuck in a very difficult league, they finished the season with a 4th place finish in the Del Rey League Final. Pomona Catholic (CIF Div. 5) – several time CIF finalists, PC was promoted to the stronger Del Rey League and failed to advance to CIF, finishing fifth. Ramona Convent (CIF Div. 5) – finished second in the Horizon League, and advanced to CIF Finals in Div. 5 for the first time in many years, maybe ever. The Tigers finished 19th in Riverside. Pioneer (CIF Div. 4) – the Titans have been on the rise, and benefited from a move this year from the powerful Del Rio League to the new 605 League. They bossed their new league, winning the championship with just 19 point. Advancing to CIF Finals for the first time, they finished a solid 11th in Div 4, and were ranked 12th overall in the San Gabriel Valley. Flintridge Prep (CIF Div. 5) – 2018 was a season of near misses. First in the Prep League, they were second in CIF-SS Div 5 and sixth at the State Meet. The Rebels were also second to Pioneer by just one point in the merge used for these rankings. They ranked 14th overall in the SGV. Azusa (CIF Div. 4) – were big winners in the Montview League, and advanced to CIF Finals in Div 4 for the second year in a row, where they finished 23rd. Rosemead (CIF Div. 3) – the Mission Valley runners-up had the SGV’s 22nd best performance at CIF Prelims, missing a spot in the Div 3 Finals by just 4 points. Baldwin Park (CIF Div. 3) This team developed a lot over the season, but did not peak as high as previous years. Third in the Valle Vista League, their season ended at Prelims for the first time since 2014. El Monte (CIF Div. 3) – fourth in the Mission Valley League, the Lions finished the year at CIF Prelims for the third year in a row. Webb (CIF Div. 5) – The Gauls powered their way to the San Joaquin championship and advanced to CIF Finals for the third year in a row, where they finished 17th. South El Monte (CIF Div. 4) – The Eagles were also fifth in their league, but ran well enough in the Mission Valley Final to rank 9th here. La Salle (CIF Div. 4) – finished just ahead of St. Paul in the Del Rey Final, but finish just behind them here in the vagaries of cross country scoring.